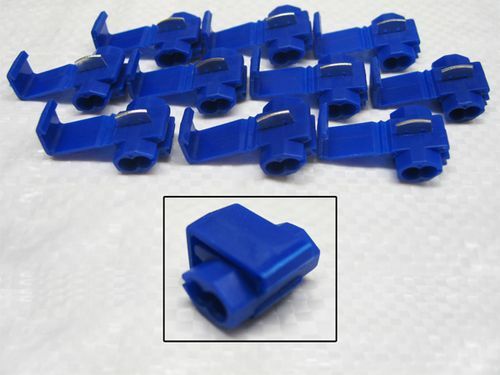 Our Blue Scotch Locks Are Perfect For Use On Crimping Wires. Our scotch locks are an easy way of connecting two cables together or taking a feed from one to another. Scotch locks do not permanently secure or lock anything into place, but instead help form electrical connections between two wires without having to cut or strip them. They’re suitable for a variety of low voltage uses in an array of applications including for low voltage cars and commercial vehicles. The blue scotch locks, that we supply, help tap into, connect and insulate wires. The electrical cables you want to connect fit into the channels and the metal piece runs perpendicular to the direction of the wires allowing it to pierce through and connect the two cables. The blue scotch locks that we stock are quick and easy to use. All you have to do is simply insert the two cables into the lock, press the metal plate down, and then close the scotch lock. We provide our scotch locks in a pack of ten and they suit wires up to 3.5mm. If you have any questions about whether our scotch locks are right for you, don’t hesitate to contact a member of our team, who will be more than happy to help you decide if our scotch locks are right for you. Why choose SecureFix Direct when purchasing Scotch Locks? We are dedicated to providing a huge variety of the best DIY hardware repair products at unbeatable prices. We pride ourselves on our high levels of customer service and can be sure to provide you with the products that you have been looking for. Purchasing your blue scotch locks is simple and easy with the help of our friendly team here at SecureFix Direct. If you would like to know more about our scotch locks, or have any other general enquiries, don’t hesitate to contact us today.